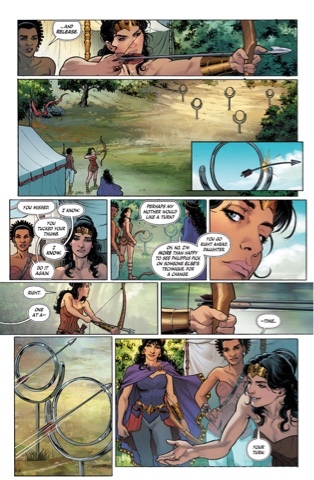 Princess Diana of the Amazons is growing up on Themyscira. Steve Trevor is undergoing rites of passage in the Air Force. Diana gets bitten by a snake. Steve is named godfather to his friends' baby. And on the final page, Diana finds Steve amid the wreckage of a crashed plane. So yes, the latest telling of Wonder Woman's origin ends where others begin. Were the previous 19 pages filled with startlingly original moments, I'd be happy with that, but they aren't. It's a very decompressed look at what happened to Diana and Steve before the real story starts - and that's not very much. There's a convincing, subtle script by Greg Rucka and beautiful art by Nicola Scott (her Steve Trevor rivals Nightwing in the Calendar Guys of DC stakes), but there's no spark. With this series being published twice monthly, we'll be getting the origin story in even-numbered issues, and the modern day, Liam Sharp-drawn story, in odd ones. In the Today tale, Diana is out to unravel the past she feels is a lie; in this sequence, we're presumably seeing the truth. It's likely the two strands will collide after a year - that's how long Scott, I believe, is committed to the book - and things will be exciting. But I could do with something intriguing now. 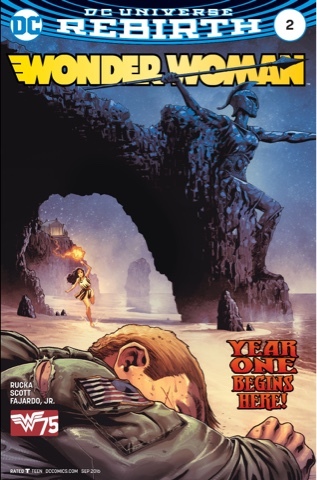 We've only just had the Young Adult delights of Renae De Liz and Ray Dillon in The Legend of Wonder Woman, and the Marston/Peter stylings of Grant Morrison and Yanick Paquette's Wonder Woman Earth One. Both were engaging from the first page. The colours by Romulo Fajardo Jr complement Scott's art, the letters by Jodi Wynne are fine, though I find the slightly italicised font in double-bordered word balloons to denote 'THEYRE NOT SPEAKING ENGLISH, YOU KNOW' a bit on the migraine side. Fajardo also works with Scott on the attractive main cover, while Frank Cho provides the balloon animal variant, complete with breast-tactic inset panel. Things I like about the detail of this issue include the namechecks for old continuity Amazons Sofia and Io; a reference to the George Perez cavewomen origin; the depiction of the relationship between Diana and a pleasantly unstuffy Queen Hippolyta; and the mystery of the serpent in the garden. The parallels between Steve and Diana's lives make sense, they don't feel forced. But where is the wonder? The big moment that will generate buzz? If the next-but-one issue doesn't surprise and thrill, I may be checking out. This is so being written in deference to the eventual trade collection, and it shows. I liked it, but let's get it moving, Greg. "Balloon animal variant" - BWA-HAHAHAHAAHHAHAHA!! Oh dear, I was mean about the variant, that's why Cho has gone! I thought there was a lot of energy in the first issue as Diana heads to meet the Cheetah. This issue seemed to loll along. As you say, there was no spark. And there certainly could have been. Hoping this side of the story picks up. Or I may only get the odd issues. That's an option - and we still get a monthly Wonder Woman book. I'll be sticking with it, but I agree 100% with the lack of story, the snail's think it's slow pacing is unbearable. Maybe next issue (he said, not being particularly optimistic based on previous form). I'd love Dan Mishkin to come back, give us a modern take on his fast-moving superheroes and soap formula. Rucka is always a meticulous planner and a slow builder. I really like his work, but I think he could benefit from the discipline of doing a year of done-in-one comics. Like you, I think this half also suffers from the recent publication of Wonder Woman Earth One and Renae de Liz's Legend of Wonder Woman. We JUST saw this story, told decompressed, and now we're doing it again. Some different wrinkles, yes, but so much is the same. Great point about the godchild, Rob - reckon she'll turn up in the modern day issues, what would she be, about 16? We've not had a new Wonder Girl for ages! It appears that Cho's art was restrained because Rucka was asking for modifications. According to Bleeding Cool today Cho quit because of it. Yeah, what a big stooshie! I was aghast at how quickly that Bleeding Cool thread grew. 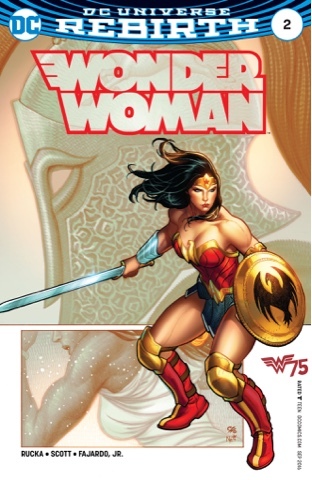 Reading "Legend of Wonder Woman" really brought back the "wonder" of WW for me, it had such a great updated-yet-classic origin with beautiful art (save for the long skirt). With the movieverse going with the TV style of Diana being millenias old, it would have been nice to have just had "Legend" be brought into continuity, which would have been very "Justice League: TAS." "Rebirth" has really brought a lot of fun back into the DC Universe (minus cat kills in Superman) but Wondy seems like a drag (and I don't just mean Cho's rendition of her). I certainly could go with that, Uncle, I loved that series and look forward to the sequel - such things as the Perry White cameo were lovely bonuses. Patience, folks, patience. Nary a man was ever fully satisfied who rushed to the end without experiencing the middle. I don't know about the middle, Hector, I think we're going to be stuck at the beginning for quite awhile!